is about a little boy who regressed into autism following a series of rabies vaccines when he was three and a half. Over a period of several weeks, he stopped speaking, feeding himself, and pottying. He stared, played with the same toys for hours, and had meltdowns. He flapped his hands, walked on his toes, and was terrified of thunderstorms and train whistles. The book spans five years in the lives of Jake, his mother Ann, and his grandmother Jennifer, who tells the story … from the agony of watching Jake disappear into the world of autism to the joy of seeing him begin to recover, with numerous diagnoses and seemingly endless regressions along the way. 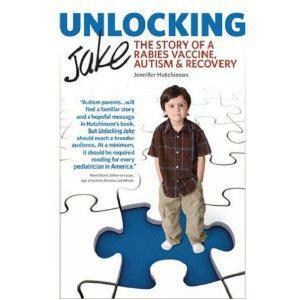 Jennifer weaves valuable information into Jake’s story, including treatments such as Floortime, occupational and physical therapy, biomedical interventions, behavior therapy, Auditory Integration Training, homeopathy, and developmental optometry, as well as a list of resources for autism and related disorders. Drawing from her personal experience, she offers advice for handling regressions, providing a sensory diet at home, navigating the IEP process, finding and starting a support group, and making an informed choice about vaccines.